Player of the Year: Neil Scally In line with every over fan group midfielder Neil Scally is the top man over the season. Neil deposes Jim Thomson who has been the winner of this award for the previous two seasons. Young Player of the Year: Jamie MacDonald Goalkeeper Jamie MacDonald had no small part to play in the steadying of a rocky defence when he came in in on loan in January, the Hearts youngster has been rewarded with all of the young player awards this term. 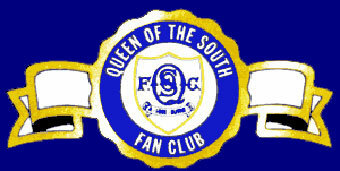 As we head for another season (2004/05) - the Queen of the South Fan Club enters it's seventh year. The Fan Club was set up by a small number of dedicated fans who wanted to give something back to the club and help them establish a youth system to develop players for the future. After initial meetings with the then Chairman Norman Blount, they decided to set up a club that would raise funds with all the profits going towards Youth Development. Over the years the club has established itself and provides a club for those who can't always attend matches. Since our foundation we have been able to donate in the region of �11,000 (eleven thousand pounds). Steven picked up the award for the second year running, although he didn't have it all his own way, he edged out Eric Paton by one vote. We are pleased for Paul Burns who took the Young player award. Paul broke into the first team, turning in some tremendous performances. It's players like Paul that we are raising the money for in the hope that we can find more like him. Congratulations to the two winners but also to all the players who pulled on the colours of Queen of the South in all age groups. At the end of season 2003/04, the Fan Club handed over one thousand pounds to the Youth coaches before the final league match against Falkirk so that they could buy sweatshirts for the Under 13, 14 & 15 sides. It's easy to join the Fan Club. There is a seasonal fee of �5.00 for adults and �2.50 for children. Please complete the form and send a cheque or postal order made payable to Queen of the South Fan Club (please do not send cash) to Membership Secretary, 58 Reoch Park, Springholm, Castle Douglas, DG7 3LL. The fee entitles you to a quarterly newsletter and Story so Far booklet which we hope will keep you up to date of what's happening at the Club. The Fan Club has a small committee of people who dedicate a lot of their spare time to organizing events and producing the material that we send to members - but we are always open to ideas. You may not have the time to help out but we would appreciate any help with new ideas for fund raising events. You provide the ideas we will do the work (unless you would like to help!). Please send any ideas to The Chairman, Brian Murphy at 115 Annan Road, Dumfries. The Fan Club committee would like to thank all those who have helped them in anyway since they were founded. Following the success of our first badge, the Fan Club are running a competition for people to design a new metal badge. All entries should be sent to Brian Murphy at 115 Annan Road, Dumfries. For an application form click on the "Join" icon.